When people say “volatility is back”, what they really mean is that downside volatility is back. Most people would not have called it “volatility” if the market was up 6.1% over 2 days at the beginning of this February, instead of down. At Plum Street Advisors, we try to maintain objectivity about volatility, whether it’s up or down, and mitigate (as much as possible) the emotional impact of dramatic newspaper headlines. First, the recent levels of volatility are perfectly normal. Volatility has been extremely low until this past week. In the chart below, we indicate all of the daily changes in the S&P 500 (whether up or down) that were greater than 2%. 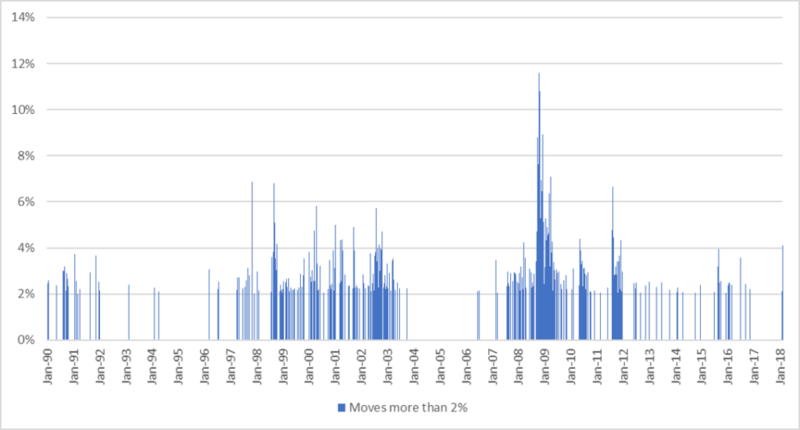 Note that the recent daily declines of just over 2% on February 2nd and just over 4% on February 5th are not at all uncommon – in fact, they are entirely expected. It’s the lack of any +/- 2% moves in 2017 that was unusual. Third, volatility can actually present opportunities for the patient long-term investor. Rebalancing portfolios can add value if prices jump around a long-term mean return as we buy assets that have recently underperformed and sell assets that have recently outperformed. Volatility is a funny thing. The news media loves it because they can sell headlines about “record” point drops in the Dow (even when the percentage changes are much less impressive). Some investors are legitimately fearful of volatility because they have mistakenly invested in risky investments with money intended for short term goals. But, for those of us investing for the longer run, it’s just business as usual. This article is informational purposes only and is not a recommendation to buy or sell any security. Any descriptions involving the investment process, portfolio characteristics, investment strategies, or goals are provided for illustration purposes only, are not complete, will not apply in all situations, may not be fully indicative of any present or future investments and may be changed at the discretion of the firm at any time. Statements herein, other than those concerning historical data, should be considered a statement of opinion and/or a forward-looking statement. You should not assume that an investment in any securities identified herein will be profitable in the future.